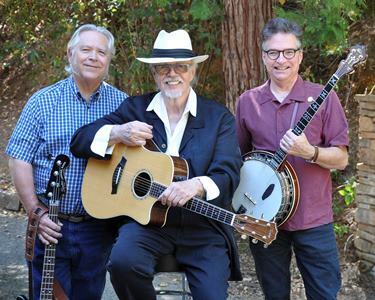 Join flatpicking pioneer Dan Crary, banjo legend Bill Evans, and Southern California acoustic favorite Wally Barnick as they come together for the first time to perform cutting edge bluegrass, folk, and Americana music. These three have all performed for us at Caltech in different groupings over the years, and we’re excited to have them in such an outstanding line-up together for this show! (LA Times). Hear Dan talk about his career, his new association with Bill and Wally, and a sampling of his amazing guitar playing here. Bill Evans is an internationally loved five-string banjo life force. Whether he’s lending his instrumental chops to a blazing fiddle tune or performing one of his original compositions, Bill is one of contemporary banjo’s treasures. He’s probably the only banjo on earth who has performed with the San Francisco Symphony, on A Prairie Home Companion and with Dan and Wally! He’s at home with traditional and contemporary bluegrass as well as branching out on the farthest musical limbs that Dan and Wally can take him. Wally Barnick (bass & vocals) describes himself as “principally a singer who some 40 years ago took up playing bass guitar in order to ensure a place in the band.” That strategy has definitely worked for this wonderful singer and instrumentalist, who is at home singing and playing everything from folk and bluegrass to Bakersfield country and even some rock and roll. Wally has performed with many familiar California Americana and bluegrass groups in these past four decades, including the Cache Valley Drifters, Bluegrass, Etc., and The Hay Dudes. His warm vocals and engaging stage presence are a perfect complement to Dan and Bill’s instrumental fireworks. A Crary, Evans & Barnick show includes new songs and old stories, blazing instrumental artistry, and deep-down, powerfully-felt musical moments. It’s whistling winds in the pines, rambling boys and tragic girls, joys and laughter from old times, furious and foot-tapping instrumental tunes, and a little touch of glory-to-God. And it’s the hovering ghosts of Jimmie Rogers and The Carter Family and Bill and Lester and Earl and Woody and all the greats who showed the way. Tickets are $20 for adults and $5 for Caltech students and children. They will soon be available to be purchased on the phone (we’re setting this up now), (626) 395-4652, with a credit card (a service charge will be added per order), purchased at the Caltech Public Events Ticket Office in the Spalding Building (California Blvd. and Wilson Avenue) for face value (open Monday-Friday from 10:00 a.m. to 4:30 pm. ), or purchased at the door for cash or check (no credit cards.) Online ticket sales will be available soon. Occasionally, a show will be sold out before the day of the show, so call the Ticket Office, if you are planning to buy tickets at the door. Better yet, join our mailing list and you’ll be informed about such situations ahead of time.